Trans. Roy. Soc. South Africa 1: 152 1909. Z. Sukkulentenk. 2: 178 1926. 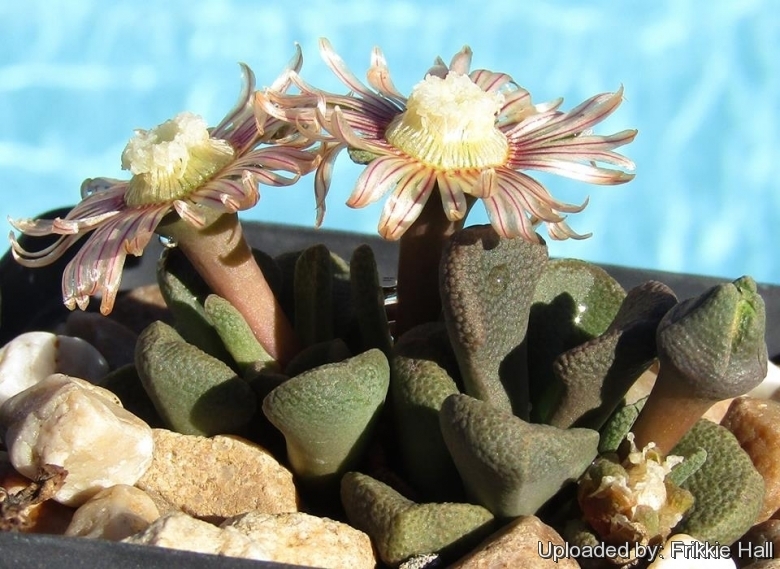 Origin and Habitat: Aloinopsis rosulata is endemic to the Eastern Cape and Western Cape, South Africa (Beaufort West to Willowmore and Steytlerville). Habitat and ecology: Nama Karoo. This species grows on rubble-strewn shale flats and lower slopes with some lime content. Aloinopsis rosulata is known from only a few records, scattered over a wide area. The rainfall amounts to less than 300 mm rainfall per annum, mainly in March and April. It is possibly overlooked, as its distribution range is botanically poorly explored. Populations appear to occur widely dispersed, but are often rich in individuals. This species is not in danger of extinction. 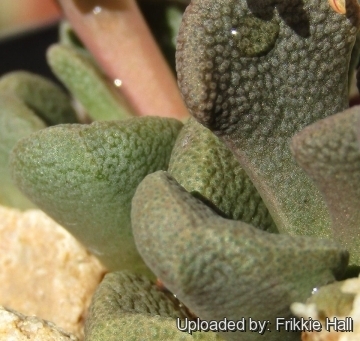 Description: Aloinopsis rosulata is a low growing succulent plant with a rosette of thick leathery, spathulate (pug-like) leaves arising from a thick tap root up to 4 cm in diameter, the whole plant will only rice to 10 cm across. It is a wintergrower, and produces pale pink flowers sporting red midline stripes. 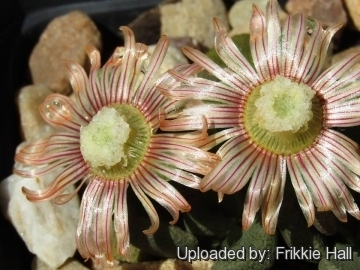 Rootstock: Up to 20 cm long, and 4 cm in diameter; like in Aloinopsis schooneesii, the tap root narrows towards the tip and the bottom, taking up much more space than the leaves. Stems: Very short, near surface fragile. Leaves: Spatulate with an apical thickening developing a triangle, often the only visible parts of the plants, about 30 mm long, 17 mm broad, 5-6 mm thicl, with moderate elevations above, wax cover rugose with few platelets or rodlets. Flowers: 11-3, bracteoles smaller than leaves, but inconspicuous. Carpels 5, petals yellow with a red stripe. Fruits (capsule): Base and top rounded, resembling an inflated lens in side view, valve wings narrowing towards the tip, closing body absent. 2) Hammer, S.A. 2013. "Mesembs, the Titanopsis group". Little Sphaeroid Press, Oakland, California. 3) Manning, J.C. and Goldblatt, P. 2012. "Plants of the Greater Cape Floristic Region 1: The Core Cape Flora". Strelitzia 29. South African National Biodiversity Institute, Pretoria. Cultivation and Propagation: Aloinopsis rosulata produced tap roots so could benefit from a full depth pot.